This addon adds a new toolbox page to the settings menu ("Settings" -> "Addons" -> "ESO Toolbox"). Here you're able to adjust some more advanced settings (e.g. the actual renderer being used, whether to use multithreading, or if you'd like to skip the intro videos) in addition to quality of life improvements like chat timestamps. This is primarily meant for those running into issues when running the game. If you don't want to edit your UserSettings.txt by hand, try adjusting the setting with this addon. I'll try to include all relevant and most often helpful options that aren't available in the game by default. If you're missing a setting, drop me a comment, and I'll add it. Periodical (and inconsistent) stuttering or freezes of the game. Graphical glitches or artifacts as well as poor performance caused by graphic card drivers. 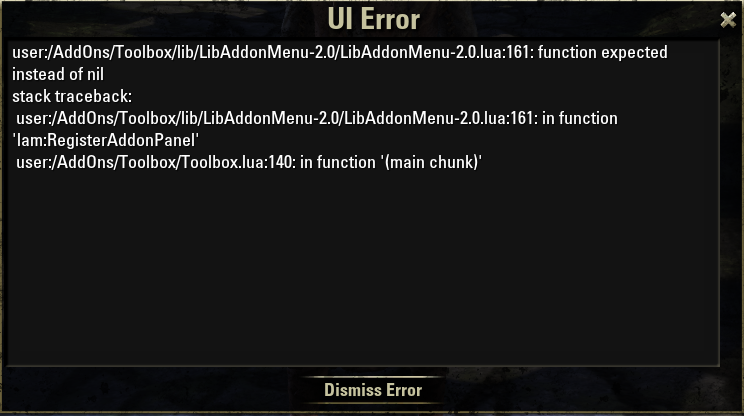 Failure to properly use many addons due to running out of memory. Select the game's screenshot format (BMP, PNG, or JPEG). Permanently disable the short logo videos shown during startup. Adjust the view distance based on FPS. Allow the chat window to grow to twice the standard size.